where personal life, recent work, educational resources & inspirational musings come together. Finding What Works... For ME. Helloooo Spring! I woke up so happy because Winter is officially OVER, which means more light & warmth and of course… wedding season! I love being a wedding photographer, you know why?! Not only do I get to meet amazing people and photograph some of their most joyful & unforgettable moments— but I also get the opportunity to indulge my senses with color & design that convey a certain feeling (unique to each couple) and fill me with inspiration. Over the years, I’ve developed a keen sense of what my couple’s wedding styles will be just by getting to know their personalities & taking notice of the times. So, today I’m going to be sharing some of the top trends I predict we’ll be seeing this year! Over the last couple of years, soft pink has been the color I’ve most commonly seen incorporated into wedding fashion & decor. But in 2019, I believe we’ll be seeing less pink & more earthy tones. The top three color palettes that I predict seeing this year, are DUSTY BLUE, MUSTARD + GREENERY & SUNSET (rust, copper, dusty rose), and combinations thereof, like emerald & copper! Pampas grass everywhere!! Bouquets, alters, arrangements, even pampas grass hanging fixtures & backdrops. 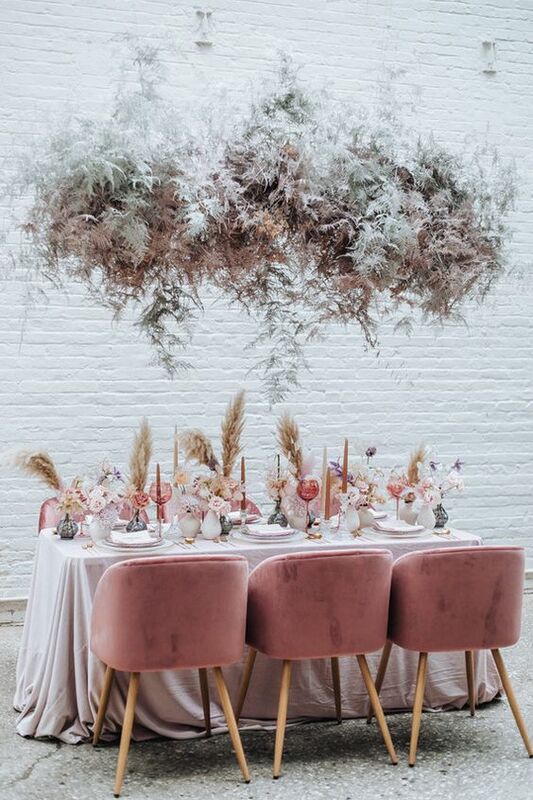 I think we’ll be seeing a lot of pampas grass in 2019… because who doesn’t love an airy, dynamic texture that can be incorporated in so many unique ways & is super affordable?! In previous years, I’ve seen minimalist ceremony decor, but I predict many couples in 2019 will be getting married in front of awe-inspiring, jaw-dropping alters that are works of art. Whether they’re uniquely shaped, or covered in floral (or a combination of the two), they are sure to make a lasting impression. I’m excited to be here with you after taking a hiatus from blogging over the past couple of years! 2019 will be my 9th wedding season as a professional photographer, but already, I feel like this year is profoundly different from the rest. Why? Well, I feel like I’ve finally found my “sweet spot” … as in, I’ve found a balance that works for me, and it feels wonderful. You see, for years I’ve been silently struggling, and comparing, and analyzing, and STRESSING… because I didn’t know another way. It all started when I began photographing weddings back in 2011. I only knew that I loved witnessing beautiful celebrations of love & commitment, as well as exercising my creative side. But, I had zero knowledge about running my own business. I literally jumped into my photography business as a means to have “something for myself” because you know, when you’re a 23-year-old stay-at-home-mom of two kids under three, it’s nice to have some time to cultivate your own dreams and purpose! So, I took the plunge & began my photography business, but ended up juggling parenting with going back to school, and gaining photography experience by any means necessary. As a self-diagnosed perfectionist, this was no easy task. I felt like I was barely keeping my head above the surface, as I navigated the waters through trial & error (personally and professionally). I believed every door that presented itself was an opportunity to learn and further my success, so I just kept saying “YES!” and piling more and more onto my plate. This included opening another business (a storefront, mind you, which is on a completely different level of business know-how!) and, while it was an amazing adventure from which I gathered an incredible amount of knowledge, I quickly realized that the only thing I was mastering, was how to spread myself too thin. I had to make some hard choices. I had to surrender what was no longer serving me, and take a good hard look at what I truly WANTED from my business, and my life. It started with being honest with myself. What did I enjoy doing? What could I let go of? What could I designate to others? If my wildest dreams came true, what would they be? How do I want others to perceive my work? How can I better connect with my clients? How do I stay true to myself in my business, instead of following the trends? How can I differenciate myself from other wedding photographers? The answers were not simple, but have led me to great insight and profound clarity. Instead of feeling overwhelmed by everything, these questions have helped me compartmentalize & develop strategies to accomplish my goals and take my business to new levels. -The Passion Planner. I’ve never been one for lists or planners, but this amazing tool is different than the rest. With a passion roadmap that helps you narrow down your top priorities into short-term and long-term goals, as well as practical overall & daily calendars that help you focus on small tasks at a time, the Passion Planner has completely transformed the way I view my life, and has helped me implement positive change & accountability. -Mentors. When I first started my business, I constantly browsed through photography & wedding blogs, soaking up every bit of knowledge I could. But reaching out to people (in real life) for mentorship has really proven fulfilling, personally & professionally. I’ve had several mentors throughout the years, who have taken me under their wings and shown me the ropes by helping me build a beautiful portfolio, and expanding my knowledge in areas of business marketing that I wouldn’t have known otherwise. The people I’ve been lucky to learn from have challenged & pushed me to grow, and I’m forever grateful. -Girl, Wash Your Face by Rachel Hollis. I laughed, I cried, I rejoiced. Reading this book literally felt like talking with a good friend over coffee; Rachel’s honest, relatable and motivating… with a no-excuse attitude. I’ve begun reciting certain passages from the book as my daily mantra & inspiration to keep going when I feel like giving in. It’s powerful, and I think every woman who picks this up will gain something from this easy-going yet powerful read. -Photographer’s Edit. Ok, I’ll admit it: editing photos is not my favorite. But, it’s obviously a huge, important part of the creative process because it helps define a photographer’s overall style. That being said, spending hours upon hours staring at my computer screen, editing thousands of photos (when I also have a million other things to get done) feels daunting & counter-productive… always leaving me feeling drained. So, when I heard about Photographer’s Edit, I figured I’d give it a try. I signed up last year… but went the entire wedding season without sending in ONE photo (control issues much?!) So this year, I’m re-committing… knowing that the perks will far outweigh my control issues. For one, I’ll have the same group of talented individuals who will get to know my style, and edit using my favorite chosen presets. Also, they have a super speedy turn-around time… so I’ll deliver my images to clients in record time. It’s honestly a win-win for everyone… if I can just let go a little bit. Which I will. I swear! -Useful Apps for Business & Life. Navigating social media for my business got a whole lot easier & time efficient when I found PLANN for Instagram & Tailwind for Pintrest (and Instagram). They allow me to edit and schedule posts so that my followers see new content… even when I’m completely offline. Also, I love that I can see what my Instagram feed will look like before finalizing my post; it takes the pressure of a “perfectly presentable feed” away, and makes social media fun again!! As far as helpful apps for my life, a current favorite is the SWEAT app by Kayla Itsines (personal trainer & Instagram superstar). With a built in planner, daily circuit work outs & more, meal plans, community boards and educational reads, this app has it all & helps me stay accountable and focus on my long-term goals. …I’m sure I’m forgetting some, but these five bullet points are noteworthy. If you’re looking to organize or implement some kind of positive change in your life, try these on for size. Also… stay tuned, because now that I’m blogging again, I’ll be sharing all kinds of fun stuff for clients, photographers and wedding industry friends, including... Personal Stuff… Educational Resources… Inspirational Musings… And of course, Recent WORK! So, let me know in the comments below what you’d like to see, and what you think of this post!